Missed the audiocast? No problem. The recording and BSA's new film are available HERE. One final reminder about the audiocast rally this Thursday, December 10 at 5:00pm. Thanks to the ten-of-thousands who have signed-up already. We want this to be the largest virtual gathering in BSA history. We hope you will join us! Hear about plans for the 100th Anniversary celebration and how to become involved. THIS JUST IN! Get a sneak-peak preview of the BSA's new high-energy, high-adventure recruitment film for the Adventure Base 100 tour. Become eligible for some very special prize drawings, including two tickets to Gala Twenty-Ten in Washington, D.C. (along with a one night's stay at a D.C. hotel). To participate, you don't have to go any further than your own computer. Just register and then listen-in at http://audiocast.scouting.org. If you have a previously scheduled, Scout meeting at the audiocast time, consider making the rally part of the meeting agenda. Tune in as a group (but register as individuals to be eligible for prizes)! "See" you on December 10! Big News on BSA Audiocast – Giveaway! 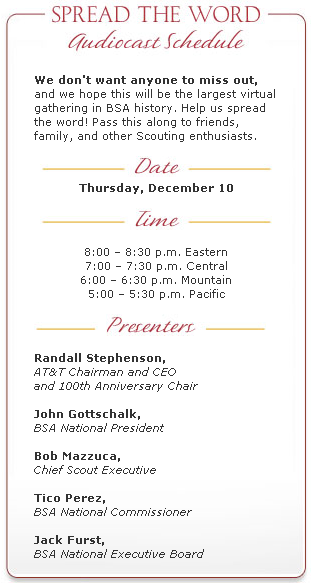 By now, we hope you have heard about BSA's Dec. 10 100th Anniversary audiocast kick-off rally! These are exciting times! And, this will be our chance to get everyone pumped up and energized for the celebration. If you have already responded, thank you! Two tickets to Gala Twenty-Ten, a very special and elegant 100th Anniversary event in Washington, D.C. on February 9, 2010. One night's hotel stay is included. A signed, limited and special edition print of Joseph Csatari's 100th Anniversary painting. A specially packaged, limited edition U.S. Mint commemorative coin honoring BSA's 100 years. All once-in-a-lifetime prizes. But, to be eligible you must be signed-up and switched-on during the audiocast rally! You don't have to go any further than your own computer. All you have to do is register and then listen-in at: http://audiocast.scouting.org. We don't want anyone to miss out, and we hope this will be the largest virtual gathering in BSA history. Help us spread the word! Pass this along to friends, family, and other Scouting enthusiasts who should be part of our historic 100th Anniversary celebration. If you have a previously scheduled Scout meeting at the audio-cast time on December 10th - consider making the rally part of the meeting agenda. Join in as a group … but, make sure individuals register for the prizes! "See" you on December 10th! Join Our Nationwide 100th Anniversary Kick-Off Rally! The year we celebrate our centennial and begin our next century of service. One of the most exciting moments in our history. To jump start the celebration, we're bringing together Scouting enthusiasts from coast-to-coast for a nationwide 100th Anniversary Kick-Off Rally. Hosted by AT&T CEO and Chairman and 100th Anniversary Chair Randall Stephenson, National President John Gottschalk, National Commissioner Tico Perez, and me, Chief Scout Executive Bob Mazzuca, we'll recognize your important role and the difference you make - everyday. Through this live audiocast, we'll share important information about how you can be part of the 100th Anniversary. We'll also answer some of your questions (submitted in advance through the link below). Our goal is to rally more than a quarter of a million Scouting enthusiasts - the largest single gathering of its kind in BSA history. 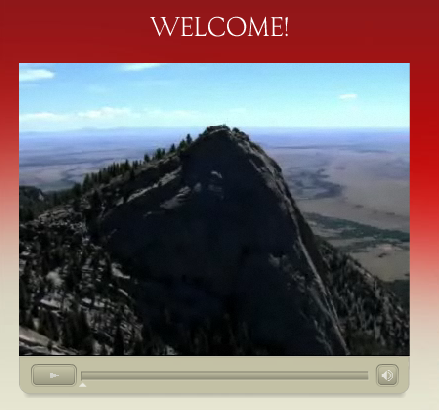 How: RSVP by clicking on "100th Anniversary Kick-Off Rally" at http://audiocast.scouting.org. That's also where you'll find the link to the audiocast on December 10th. You are the reason this great movement works - the passionate supporters and boots on the ground serving youth across America. 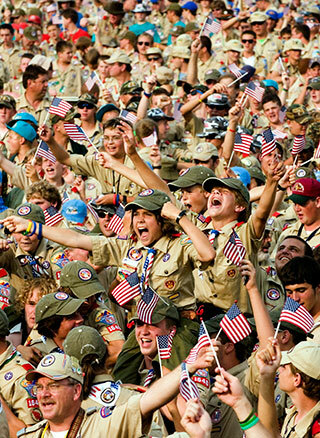 The 100th Anniversary celebration is meant to inspire, excite, and engage the entire Scouting family. Join us as we embark upon this once-in-a-lifetime journey. Save the date! And, tune in on December 10th.